It’s almost been a year since I drew up these plans for a hammock bivy and I thought I might as well publish them. During this time there were a few hammock bivy projects popping up, including the Kickstarter-funded Alpine Hammock and the MMG Bivy Hammock. This is truly a do-it-yourself project; I’m just waiting on some free time to sew this one up, but if you beat me to it, send me some photos! One of the major appeals for a “convertible” hammock is for those times when you are above the treeline or in an area where trees are scarce or non-existent. Of course, any hammock can be pitched on the ground in these cases, but the bivy design takes cues from bivy sleeping sacks that minimize or eliminate a tarp, relying on a waterproof shell for weather protection. Another advantage or goal of a bivy hammock is simplicity, and it follows that it would be lighter, at least in theory. One challenge with bivy sacks in general is breathability. Anything truly waterproof often suffers from poor breathability, resulting in increased condensation inside the bag. Improved fabrics from GORE-TEX and eVent help make this possible and are getting better all the time. The design I drew up is a hybrid design to maximize modularity. One goal was to use a full-size hammock, opting for a longer length and shorter width for increased comfort in hammock mode. I designed the bug net “window” to be larger for better breath and moisture management. 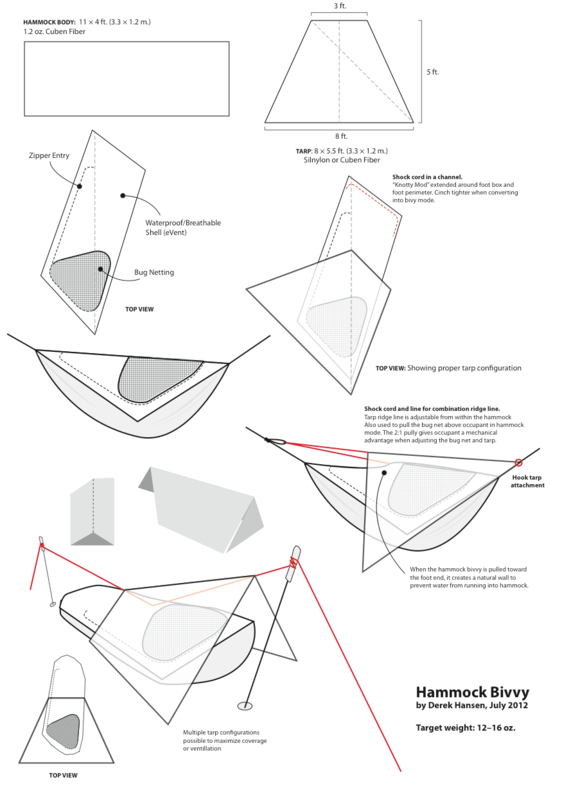 The minimal tarp is designed to pitch in different ways depending on which mode the shelter is used. An inner pull mechanism, like on my HUG bug net design, allows the occupant to adjust the tarp tension and to increase or decrease the space inside, allowing for more air space and theoretically limiting condensation. This is exactly what I’ve been looking for. Have a camo Clark which is pretty lux, but I’d like to try making something lighter out of cuben. Has anybody made this? Nothing exactly, but Alpine Hammock has been working on a design, along with Ajillis, and Mac Molly Gear. I have a very basic, very cheap bivy sac, used it a lot. Love it. Usually it’s just rolled up, sleeping bag, pad inside. I unroll it, blow up the pad and I’m ready. No rain fly. If it rains, and it has (mountain top, 40 mph wind and rain) I just turn the bug netting away from the wind. It shouldn’t work but it does. When I think of a hammock-bivy I think of one of the quick set ups, snake-skins, ridge line, integrated bug netting, easy tarp. Used as a bivy I’m thinking prop up the ends of the hammock on the hiking poles, so the ridgeline, ends of the hammock all come together. This way you don’t have to take your set-up apart. The tarp can reconfigure a bit. The bottom of my hammock is not waterproof, so maybe underwrap the tarp. The basic idea is to create that tent bottom bathtub completely under the overhead tarp. And keep the hammock from laying on wet muddy ground. I’ve built some kayaks and am a DIY guy, but I must say I am really impressed and excited by all the thinking, inventing, figuring it out going on with hammock-ers. (Is that the term? ) I’m just sorry I’m so late to the party.